There is one thing to be said for Author Yefim Gordon, and that he has been very energetic in mapping the highways and byways of Soviet and Russian aviation developments. Red Star Volume 32 falls very much into the latter, covering as it does the last jet designs of OKB-301 headed up by Semyon Lavochkin. Strictly speaking it does not cover all the designs as the La-250 "Anaconda" is covered in Red Star 19 "Soviet Heavy Interceptors" but let’s not quibble. 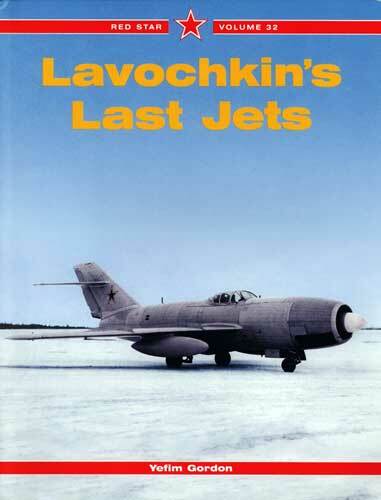 Lavochkin was considered in the immediate post war period to be one of the four Soviet fighter designers along with Yak, MiG and Sukhoi. Indeed the La-5 and La-7 outclassed rivals such as the Yak-9 at low altitude. It is therefore all the more sad to read this chronicle of what might have been had some of the early post war designs entered production ahead of the rival MiG-15. Indeed it was the MiG-15’s ease of production rather than the superior all round performance of the La-15, not to mention apparently misplaced safety concerns with the early production batch which meant that the USSR fielded a fighter only marginally superior to the F-86A in the Korean War, thereby saving many Allied pilots. This volume follows the now familiar route of all Red Star books, with a short historical background followed by type by type histories of the subject aircraft. In this case it is the La-15 FANTAIL and its experimental developments, the La-190 and the La-200 which get the Gordon treatment. As always the highly readable text is accompanied by extensive archival photographs and detailed drawings of the subjects, both contemporary and specially drafted for publication. Among the highlights were the colour photos of the La-15s of 196th Fighter Regiment (IAP) getting airborne for the 1949 Aviation Day Parade. The final few pages of the book are given over to range of colour profiles of the subject aircraft and these are worth their weight alone from a modeling perspective. There seems to a 1/72 kit of the La-15 available from a manufacturer in Russia, but I was unable to determine the company name. If one is seeking to model the La-15, then this volume would have to be a one stop reference shop and from that perspective is recommended.